2017 saw EGB launch a new set of Championship classes. The National Championship has long been a fixture on the EGB ride calendar but this year an additional three championships were launched for Novice, Open and Advanced level with the finals held at the Red Dragon to coincide with the ride’s 40th anniversary on 29th Sep - 1st Oct. The weather was certainly not kind over the course of the weekend with heavy rain in the run up to the ride making going slippery on the hills and boggy on the moors. The ride days themselves saw continued rain with some quite heavy fog in places in higher areas….some might say typical Red Dragon weather! There was a strong turnout of Wessex members in classes across the weekend with Wessex members winning in 3 of the 4 championship classes in some very tough conditions. We asked the championship winners to recap their experiences of the weekend .... click here to view their reports! The FEI has announced an adverse analytical finding involving a prohibited substance. The new case involves the use of O-Desmethyl Venlafaxine, which is a *Banned Substance under the FEI’s Equine Anti-Doping and Controlled Medication Regulations (EADCMRs). The athlete has been provisionally suspended from the date of notification (16 October 2017) until the FEI Tribunal renders a decision. The horse has been provisionally suspended for two months. Keen riders can pick up tips and tricks on keeping their horses healthy while riding long distances at an endurance-riding training-day. The South Coast Zone Endurance Riders Association (SCZERA) will hold educational talks and introductory rides at Willinga Park, Malua Bay, on December 3. Committee member Clare Feary said the training day gave keen riders right along the south coast the chance to try endurance riding in a supportive environment. “The sport motto is: to complete is to win,” Ms Feary said. She said joining any new sport could be confusing and difficult. “We are welcoming new riders: Offering10, 20, and 40 kilometre rides and explaining all the rules and processes involved,” she said. Dubai: The 2017-18 endurance season gets under way at Dubai International Endurance City (DIEC) this Friday and Saturday with two rides held over 100km — the Seeh Al Salam Endurance Challenge and Al Wasl Endurance Cup, restricted to private stables and individuals. The purpose-built DIEC facility, located adjacent to the Bab Al Shams Desert Resort and Spa, is gearing up to host some of the UAE’s most prominent endurance rides including the HH Shaikh Mohammad Bin Rashid Al Maktoum Endurance Cup Festival as well as the Crown Prince Endurance Cup Festival. An endurance horse rider has been inducted into the Marlborough Sports Hall of Fame. Renwick woman Tess Wells was added to the region's list of sporting elite at a special ceremony at the Marlborough District Council on Monday. The South Island champion has just returned from Queensland, Australia after representing Equestrian Sport New Zealand (ESNZ) in the Endurance trans-Tasman challenge. Wells was named Marlborough Endurance Rider of the year by the Marlborough Endurance Club in July. Wells said she was "quite nervous" for Monday night's ceremony, but excited to be inducted into the Marlborough Sports Hall of Fame, which is for Marlburians who have competed for New Zealand, in an international event at a senior level. Her horse Barney was quite a character, with his "own opinion, everything else is a compromise", she said. "He's not naughty, [he] just has a mind of his own..."
Equestrian Australia (EA) will be working closely with the Australian Sports Anti-Doping Authority (ASADA) and introducing random drug testing at events throughout Australia moving forward. We are continually focussed on building awareness of the importance of drug-free competition at all EA sanctioned events as well as improving Member safety and horse welfare. As highlighted in EA’s Strategic Plan 2017-2020 it is a priority for Equestrian sport’s National Federation to promote safe, fair and drug-free competition and develop sound policy and process to manage and monitor Member safety. From March 31st 2018, all EA coaches will have completed a minimum of the ASADA online Level 1 anti-doping course which can be located at https://elearning.asada.gov.au/ in order to renew their coaching memberships. However, EA also invites any equestrian member to take the free, online course that takes just over one hour to complete. Officials will continue to be vigilant and will follow a strict reporting procedure at all EA sanctioned events should they be concerned about any athlete’s welfare in relation to any form of substance abuse. This initiative is aimed at helping to ensure that competitors present themselves and their horses at all events drug-free and uphold the values of clean sport at all times. 16 October 2017, Paris, France ~ Arthur Desprez riding 8-year-old Verseau D’Aurabelle led a clean sweep of the French riders in the CEI Two-star 120-km HH Sheikh Mansoor Bin Zayed Al Nahyan Cup held on Saturday, 14 October 2017 in the forest of Fontainebleau about 60 kms from the French capital of Paris. Desprez and his horse were in 5th place when they started on the final stage of 23kms. Until then they had averaged just over 20kmph, but in the final stage Desprez increased the pace to 25.89 kph gaining the lead from Laetita Pegaz Tocquet on Vegas De Majorie, with only one second separating the two riders. The winner completed the four-stage 120-km ride in a timing of 6 hours 02 minutes and 36 seconds. Long Distance. Young Rider. Big Accomplishment! In early 2017, Anya Levermann of 100 Mile House, BC received elite status from the Fédération Equestre Internationale (FEI), allowing her to represent Canada in the FEI World Endurance Championships for Juniors and Young Riders in Verona, ITA on Sept. 23, 2017. Equestrian Canada (EC) caught up with Anya after she returned home, to talk about her experience becoming the first Canadian to complete the championship, and finishing 51st out of 93 of the top junior endurance athletes in the world. It was 10 years ago that Anya began riding endurance, an equestrian discipline that tests the endurance of horse and rider over varied terrain. As her passion for the sport grew, so did her ability to maintain safe management of a horse’s stamina and fitness. Endurance is a discipline that, although timed, puts the true emphasis on completing the race in good condition rather than racing the clock. Race report made with the assistance of Lucia Olascoaga. Punta del Este, Maldonado, Uruguay. Thursday 12 October 2017. Pan American Championship, Uruguay gets all four gold medal medals: Individual Senior, Team Senior, Young Rider Individual and Team Young Rider. The Pan American Championship being held every two years, reunites the power endurance nations of the region like Argentina, Brazil, Chile, Ecuador, Guatemala and Uruguay. Is was the first time that this championship took place in Punta del Este. The 120km were divided into 4 stages of 39.6km, 28.7km, 28.7km and last loop of 23km. We witnessed some very intense racing in both categories. The senior category was won by Isha Judd – URU riding JQ Zarial. This horse raced to fifth place in the last World Championship in Slovakia. Mill Spring, N.C. - Tickets for the FEI World Equestrian Games™ Tryon 2018 (WEG) are now on sale. Set for September 11 through September 23 in the scenic Carolinas region of the United States, spectators can choose from a variety of ticket types to experience the world's largest equestrian championship. With all competitions happening on site at Tryon International Equestrian Center (TIEC) in Mill Spring, N.C., attendees can come for the day, a week, or the entire Games. Tickets are available online at www.tryon2018.com. Select "Buy Tickets" from the menu. 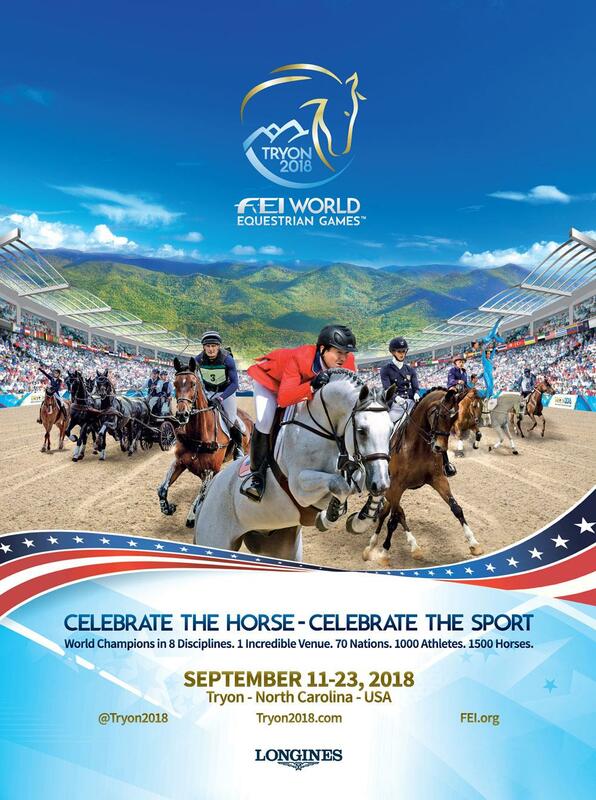 Click here for FEI World Equestrian Games™ Tryon 2018 tickets. The initial sale of tickets for the FEI World Equestrian Games™ Tryon 2018 includes the following options: All Games Pass, Week 1 Pass, Week 2 Pass, and All Session Day Passes for all of the eight disciplines. Individual Discipline specific day sessions will be sold, subject to availability, in early November after all multi-session discipline tickets are sold. Mark Bellissimo, CEO of host venue Tryon International Equestrian Center in Mill Spring, N.C., USA, said: "Demand from the event is way beyond our expectations, and it would not surprise me if this event were to sell out early. We have experienced unprecedented demand, far bigger than we ever anticipated. There is tremendous appetite for this event, so we encourage people to buy now." Opening Ceremonies and Closing Ceremonies tickets will be sold separately in early December after details are released. Day passes that allow access to the venue to experience the trade fair, event expo, as well as equestrian demonstrations will be sold three months prior to the event. VIP tickets and hospitality packages will also be released in early November, and customers can trade up their purchased tickets toward these higher-value ticketing/hospitality options. Prices do not include tax and 8.5 percent processing fee, which will be applied upon checkout. Muscat: Royal Cavalry of Oman riders dominated the FEI Babenhausen Endurance Race taking top three places in Germany on Saturday. According to information received from Royal Cavalry of Oman, the 160km race saw Faisal bin Ibrahim Al Farsi astride mare ‘Cara’ taking the top honours. Mahmood bin Marhoun Al Foori on mare ‘Daleelah’ finished second and he was followed by Adel bin Said Al Balushi on stallion ‘Rafael De Lava Goal’ in the third place. Alleged corruption, bullying and elitism at the top of British equestrianism was under investigation on Friday night following the launch of an independent review into the sport. The British Equestrian Federation became the latest governing body in receipt of millions of pounds of public money to face an external investigation into its internal workings in a probe prompted by the exit of its chief executive after barely a year in charge. In her July 13 resignation letter, Clare Salmon raised what Joanne Shaw, the BEF chairman, described as “significant and serious concerns about culture, governance and the interaction of some of the member bodies”. Shaw announced the BEF board would commission an independent investigation, which was launched on Thursday and is being chaired by John Mehrzad, head of the sports law group at Littleton barristers’ chambers. Morocco & the Boudheib Initiative making history ! This weekend saw the latest International Boudheib Initiative (BI) sponsored endurance event in Morocco's outstanding cedar forest of the Middle Atlas area of Ifran, and for the first time in Moroccan history, the first FEI CEI 1* 80km ride was held together with the BECA award for best condition. For the 2nd year since inception, His Highness Sheikh Sultan bin Zayed Al Nahyan is delighted to encourage education of the 'welfare of the endurance horse' through BI ground breaking events worldwide and takes great pride in aiding development of the true sport of endurance at grass roots level proving time and again the value of strong partnerships between horse & rider. Great care was offered by the veterinary delegation headed by Technical Delegate, Mohamed Khalfan Alyammahi, and a full day of judge & vets briefing was held in order to work closely with newcomers to the FEI, explaining health & rules for the benefit of the horse and reminding them to not be flexible when it comes to rider security and horse welfare. The picturesque trails were perfect, with good markings, loop speeds were low averaging around 15kph ensuring an excellent 80% completion rate throughout all rides including the 3 national qualifiers of 60km, 40km & 20km, for newcomers to the sport. There was a wonderful spirit throughout the day with everyone showing their willingness to learn and they are all looking forward to the future growth of this event and to returning next year. Special thanks goes to event organiser, Dr. Mohamed Machmoum, Director of the upcoming Salon de Cheval at El Jedida, the veterinary delegation for their unfailing hard work and to the many dignitaries who attended the event, including Ahmed Al Reasi, Chairman of the Emirates Equestrian Federation, Dr. Hammou Ouhelli, Moroccan Minister of Rural Development & Forests, General Merzak El Habili, General Secretary of the Moroccan Royal Equestrian Federation and Zouhair Mohamed, General Secretary of Ifran, and of course not forgetting all the riders, grooms, owners & trainers and our valued partners, the horses, without whom none of the events could take place! Feed supplement additive MSM has been removed from the FEI’s prohibited substance list after a U-turn by the international federation. Confusion had been caused by the inclusion of MSM (methyl sulphonyl methane), under its seldom-used alias dimethy sulphone (DSM), on the FEI’s list as a controlled medication and specified substance from 1 January next year. The FEI told H&H in June that the naturally occurring substance, which is found in many plants and widely used in equine feed and supplements, is also the major metabolite of banned chemical DMSO, or the substance into which this solvent is broken down in the body. Great Britain: Annie Joppe’s endurance blog: is this the way forward for endurance? I’m still counting down until I can ride again; but it’s now only just over three weeks until both Wizard’s and Chiara’s shoes go back on and work commences. Usually I continue to compete right up to the end of the season and then rest the endurance horses until the New Year. This time, although all three of the horses were qualified for the national championships at the Red Dragon ride, I decided against competing there this year. Emirati rider Fatima Al Harthi is emerging as a force to be reckoned with in the challenging field of equestrian endurance riding in the UAE. Video courtesy of Abu Dhabi Sports Council. Fatima Al Harthi is one of the most promising equestrian endurance riders in the United Arab Emirates. The 27-year-old was inspired by her mother’s love of sport as a child and took up riding as a result. Despite having a full-time job, the young Emirati dedicates two hours a day to her training as she looks to make an impact in the field of endurance riding. Kurtuvenai, Lithuania. Saturday 16 and Sunday 17 September 2017. Kurtuvenai hosted the sixth Northern Baltic Countries Equestrian Endurance Championship. 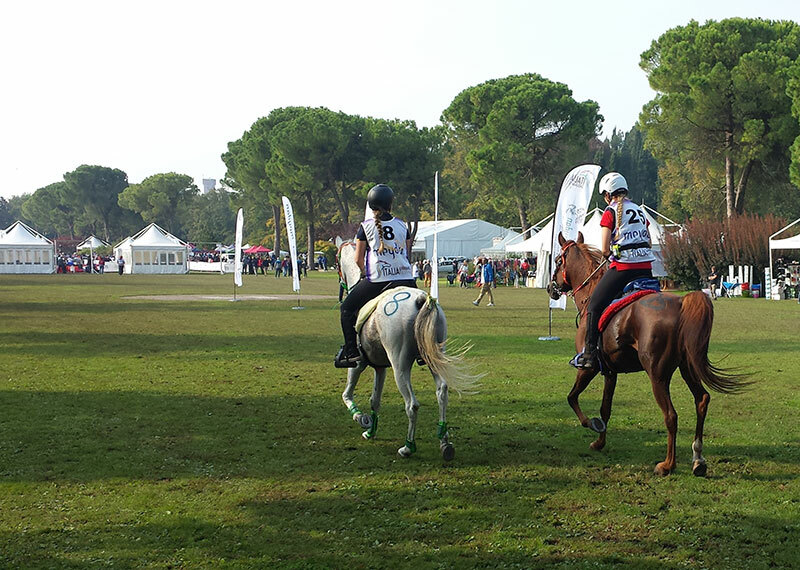 Senior riders competed in CEI2* 120km and Juniors in CEIYJ1* 80km. More than 50 combinations from Lithuania, Estonia, Denmark, Norway, Sweden, Finland, Poland, and Byelorussia attended. Endurance World Lithuania. In the forest.A though and rainy day on the eve of the competition concerned the competitors, but the weather changed to a sunny race day creating favourable conditions for the riders allowing them to go at high speed. The battle between the most experienced riders continued till the finish line and the winner in the CEI2* 120km Kairit Jarv – EST (Mustafo Malabah) crossed the line side by side with her closest competitor ( average speed of 18.52 km/h). Second place and the Best Condition Prestige’s prize was won by Olaug Espeli Carstensen – NOR (Yassir II). The third place went to Marian Kikas – EST (Jaliszko).